As my colleague and friend Kellee mentioned of the film director, screenwriter, producer, and business magnate, Steven Spielberg, “…has become an American institution via the silver screen.” Considering his professional directing début began on TV, it’s worked out pretty darn well for him. Enough to earn him small-screen (episodes of Marcus Welby, The Name of the Game, Columbo, and the TV movie, Duel) and big-screen gigs (JAWS, Close Encounters of the Third Kind, Raiders of the Lost Ark) as a result. Television has proved good to him. So it shouldn’t surprise Spielberg has kept his hand on the television till from time to time. To say this noted filmmaker was a hot property by the mid-’80s would be an understatement. Beyond those already mentioned, Spielberg had added E.T. the Extra-Terrestrial, Indiana Jones and the Temple of Doom, and had in the offing his mature change-up, The Color Purple, for his résumé. Throw in his new Executive Producer hat (Poltergeist, The Twilight Zone, Gremlins, and The Goonies) and the world was his oyster, to say the least. His ability to call the shots at this stage was without question. He used his new clout with his old haunt, Universal Studios, to back something surprising. A weekly anthology show for network television. Along the lines of something say like…Night Gallery. This time, though, nowhere near as dark as that, with the somewhat innocuous title Amazing Stories. Using the name from a pulp fiction magazine, AS centered more with the fantastical storylines for its series rather than horror, though did not forgo the latter entirely. NBC eventually picked up the anthology program. Even committed to two seasons, the stipulation being big names (those wishing to work with the current Golden Boy of Hollywood) be in front and behind the camera for its episodes. Oh, and Mr. Spielberg himself had to direct two episodes in the initial season. Ironically, Amazing Stories would be matched up against an updated Twilight Zone series by a rival network. Seems like Spielberg’s former connection with Rod Serling would continue to materialize in one ghostly form or another. It, too, featured prestigious names behind and in front of the camera. Still, Spielberg’s production was brimming with talent. Veterans like Clint Eastwood with up-and-coming directors Phil Joanou, along with big-name casts, guaranteed a number of sponsors and viewership for the opening weeks of their first season. So the big guns were certainly rolled out. None bigger than Spielberg himself, his opening stint with Amazing Stories, which would land on the fifth episode, The Mission. Only the most jaded of viewers would be disappointed with the result. Steven Spielberg put forth a story of his (an early connection with World War II he’d only progress in later efforts, Schindler’s List, Saving Private Ryan, Band of Brothers, The Pacific, among others) for this effort. 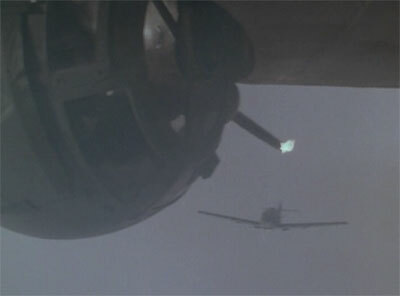 “The Mission,” chronicled an American B-17 bomber on its 23rd and final mission. The air crew’s good luck charm, their belly gunner and amateur cartoonist Jonathan (Casey Siemaszko) having fulfilled his service commitment and not having to join in, back for one more bomb run with his war buddies. Tempting fate. Tipping the scales at a mere 46 minutes, for television commercial breaks, this episode clearly fought above its weight class. Amazing Stories programs were unusually high-end for the small-screen budgets of the time. Reportedly, for this show the figure was near $1 million per. Spielberg’s status good for it in NBC’s collective mind, at least for awhile. He was not about to dash their hopes. The look and feel of “The Mission” episode, with help from the series director of photography John McPherson, exuded more of the cinematic than most of the pedestrian television products on the air that year. Spielberg’s opening pull-back shot centered on the two prime aspects of the momentous tale set to unfold. A hand drawn cartoon, along with one of the unique features of the B-17, the ball gun turret. Everything that will come into play in the tale thrown right out there from the start. During this fateful bombing mission, the plane battling off German fighters, takes a heavy hit. Sustaining enough damage its return leg home to the bomber group’s airfield in England now in jeopardy. But also trapping the mascot young man into his tight compartment. 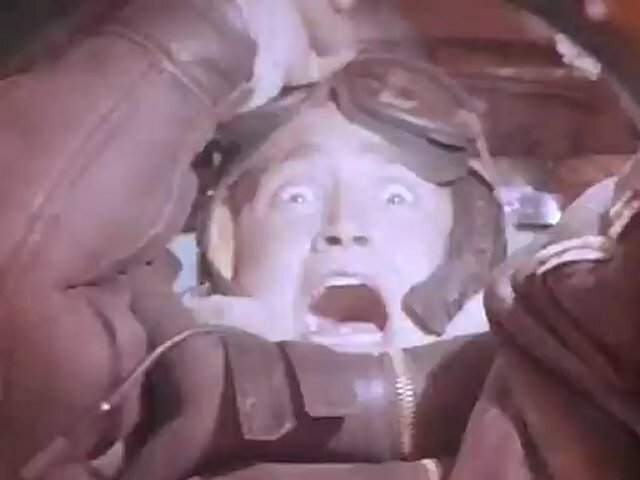 With the landing gear destroyed, the trapped gunner doomed, seemingly. 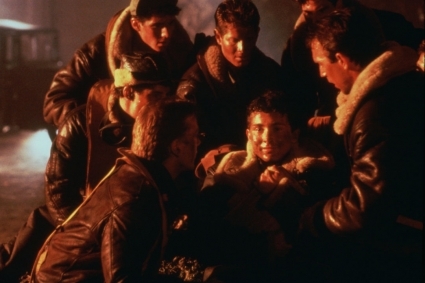 Everything we’d come to expect from Steven Spielberg, in sentiment and story, was on display in “The Mission.” As well, more than a few of us could spot its link to William Wyler’s 1944 documentary film, The Memphis Belle: A Story of a Flying Fortress. 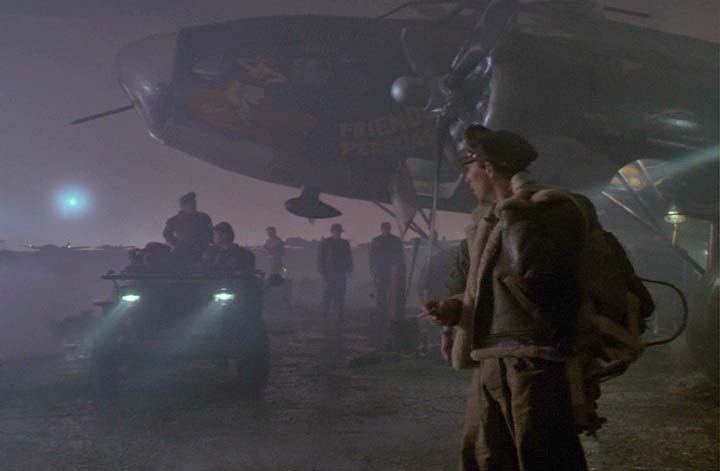 Besides that it would go on to inspire a similarly themed Memphis Belle (1990) film a few years later, too. Yet, and this is key, the World War II backdrop, is just that. Backdrop. Merely a setting, the background for the dramatic tale. One less concerned with the air combat around them, and more to what we’ve come to know this filmmaker for. The tenet he centers flexibly upon more than others. The light-hearted frivolity of those plucky Yanks at the start, with their typical jovial comrades-in-arms banter, speaking to their futures after completing the task of removing those pesky Nazis from Europe, turned on its head in a one-hour episode chock full of emotional duress. The crew forced to face the death of a beloved member in the smallest of spaces. For a tale presenting a story in the big blue yonder, Spielberg created a surprisingly close-quarter affair. Framing the story so it distilled everything within the confines of the vintage aircraft, a gun turret, and all those young faces in a remarkable cast. Certainly, among the standouts, were future film star Kevin Costner, already with Fandango, Silverado and American Flyers under his belt, as the Captain. His breakthrough role in The Untouchables (1987) in his immediate future. Kiefer Sutherland, finally in his career less than a movie cad with this his TV debut — and he didn’t have yell his lines à la Jack Bauer, at that. Go figure. This was also the brief screen debut for Anthony LaPaglia. Still, it is Casey Siemaszko (who’d go on to a fairly prolific career on TV and movie roles) who was at the heart of the fable. He’s heartbreaking as the doomed gunner in this stellar segment. The fantastical aspect at conclusion of the story may be a bit much for some, but it still grabs at the heart, nonetheless. Pure, unadulterated Spielberg. At least for me. Dutch screenwriter Menno Mayjes crafted Spielberg’s story into a tight, tension-filled narrative for the filmmaker-turned-television producer-director. He’d write or co-write Spielberg’s The Color Purple, Indiana Jones and the Last Crusade and others soon thereafter. He’d share credit to one of the show’s signature episodes, in the bargain. If there’s a list of the top installments for Amazing Stories in its all too short run — NBC promised it two years and that’s all what it got — this tops it. At least in my opinion. For those like me who saw it first-run one night in the midst of the Reagan ’80s, it is the most remembered from this anthology series. Bar none. Just old hat for someone like Steven Spielberg, really. 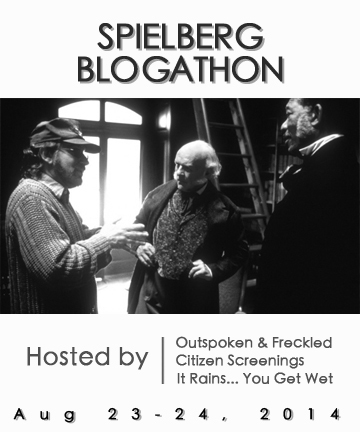 This post is part of the SPIELBERG BLOGATHON hosted by Outspoken & Freckled, It Rains… You Get Wet, and Once Upon A Screen taking place August 23-24. Please visit these host blogs for a full list of participating blogs. Really impressive overview Michael. I remember liking it a lot at the time – or at least, right until the end, which really disappointed me. This is a shame because that’s where a lot of anthologies tend to fail and the snap or surprise of the finish should not be most important aspect. In this case, much as I liked it up to that point, it just didn’t do it for me, though it is certainly very Spielbergian! Makes for an interesting contrast with ALWAYS, which I love pretty much unconditionally. I almost went with ALWAYS for my contribution before deciding on these very different anthology episodes by the man. I have the DVD, but I keep on the lookout for the Blu-ray. Which reminds me, I’ve not seen it in a few years. Superlative work on a touch stone tale! Mr. Spielberg hit a solid triple with ‘The Mission’. Allowing a lot of young talent to swing for the fences. My Reserve maintenance squadron had a B-17 G in one of our hangars at Andrews, AFB after an air show years ago. And you would be surprised at just how small and cramped that iron bird is behind the cockpit or flight station; compared to modern aircraft. Loud, too. Once its four Pratt & Whitney piston engines wound up. It was no small trick to get most everything right before and after the heavy’s bomb run. High marks all the way around! This is easily one of the best things that’s ever been on TV.